Girl, n. A giggle with glitter on it. Oh my goodness, I've been capturing memories for these two since little Noelle was still in her momma's belly. Now Gabriel is turning one and it's hard to imagine where the time went! We planned this shoot months ago for the NC History Museum expecting it to be freezing outside so Gabe and Noelle could marvel at the dinosaurs and we could all stay a little warmer. That ended up not being necessary though; it's almost 80 degrees outside today! I will take it, love me some spring weather in the middle of winter! 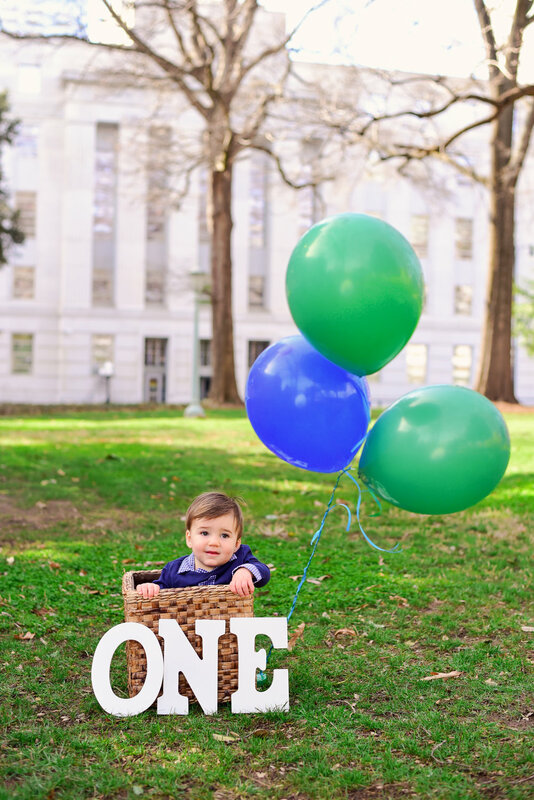 We ended up hanging out on the Capitol Building's lawn so we could include some green trees and grass with Gabe's one year balloons. I just love how these two already love each other! Sometimes kiddos don't respond well to snuggling and kisses but Noelle was more than happy to stay right by her Gabe and make sure he could walk around without falling. I hope you enjoy a few of these favorites from this morning!